Good news abounds in Radio Active #12, which includes an announcement about a change in my day job that will let me walk to work. Really. 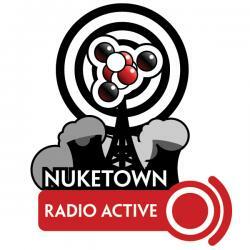 It’s also got an announcement about the Atomic Swindlers contest winners and the happy news that Radio Active has joined the ranks of The Science Fiction Podcast Network. It’s not all chat though — there’s also a short review of the Xbox version of Star Wars: Knights of the Old Republic II as well as a review of Stephen King’s very un-King-like horror novel From a Buick 8. Shameless plug: don’t forget to vote for Radio Active on Podcast Alley [Web Archive] and Podcast Pickle [Web Archive] (and yes, those links will take you directly to Radio Active’s entries.. Accepted a job as a web application developer at a college down the street from me. Not figuratively down the street … it’s like 8 blocks. I can walk there. Hell, walking will probably take less time than driving. The Web site for my long-running gaming group, which has been together since around 1996. Finally broke it out into its own site. Debunkings and commentary from a skeptical point of view. Being of a skeptical bent myself, listening to this show is like audio gold. Been searching for a good RPG-centric show ever since Mortality Radio went silent. All Games Considered is that podcast; while it doesn’t have the interviews that Mortality had, it’s got RPG news and plenty of great banter and commentary. And I thought that even before they linked to Nuketown. A round table discussion of all things geeky, including movies, games, weird science, etc. Great audio set-up, which gives each host their own speaker. Very cool. Like it did for many adult geeks, Knights of the Old Republic has redeemed Star Wars for my daughter; she likes watching me play the game. And I like playing it. While KOTOR I had a harder driving, more cohesive story, I’m enjoying KOTOR II more because it offers more flexibility. Play this game, one sees a Jedi Order more like that in the new trilogy: indecisive, unable to see the true dangers afoot. The Sith are more seductive as a result: when the Mandalorian War breaks out and the Jedi refuse to intervene, who can blame Malak and Revin for breaking ranks with their fellow Jedi and leading the counter attack? While this leads to the Jedi Civl War as the two renegades discover the ancient Sith teachings, it’s a far more believable corruption than what we see in Episode III. And even after the war, as this game shows, the Jedi still aren’t sure what to make of their own failures, or the two renegades admitted victories. If they had chosen to join the fight, might they have prevented the rise of the Sith? In this book, a mysterious and dangerous car — a strange kind of Buick — is left at a gas station in rural Pennsylvania. It’s impounded by members of Pennsylvania State Police Troop D, and over the next few years increasingly bizarre events echo out from the car, terrorizing its sworn protectors with its sheer alienness. Very unlike other King stories, in that there is nothing to fight. The Buick is strange beyond words and the threats it summons up are not boogymen who stalk the countryside, but rather horrors so innately alien that the mind shudders to comprehend them. Told through a series of flashbacks, in which the members of Troop D try and explain the Buick to the son of a deceased trooper — a trooper who just might have died because he delved too deeply into the Buick’s secrets.